In St. Petersburg there are a lot of snug parks and squares. About some of them tourists don't even know but they are worth to be seen! It is widely accepted that an unusual garden and if to be more precise at once two gardens, coming one after another in the yard of the house number 46 on Liteyny Avenue, were landed in 1905 on the order of Councillor of State Fedor von Kruse, but actually that is not quite the case. 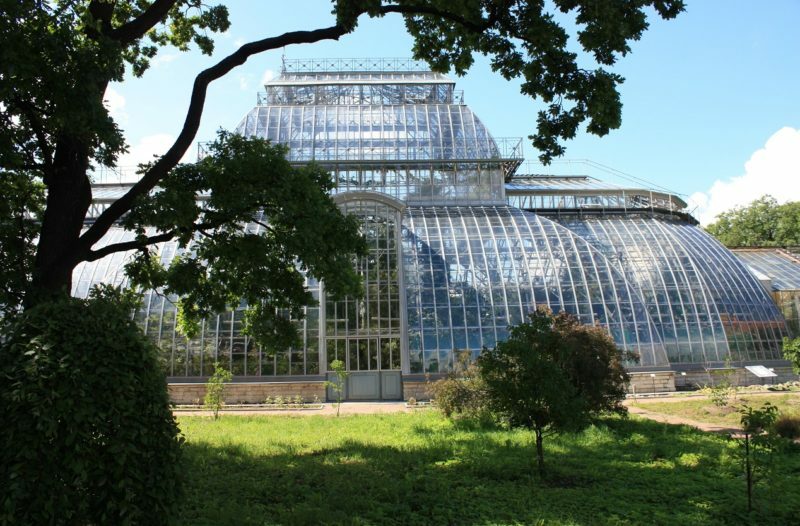 At the very beginning of the 19th century the famous city bibliophile Pyotr Khlebnikov, the first owner of this land parcel, built here a fine greenhouse with a belvedere in the center. One of the following owners of the place, the architect Alexander Pel, laid out a garden according to his own view. And Fedor von Kruse added the conceptual design which the residents of the city on Neva can contemplate to the present time. About forty years ago the city youth named this yard as "St-Germain", "Pale Royal'" or "Belveder". In spite of the entrance under automatic antitheft system constructed today, nobody prevents you waiting for residents and getting to the historical garden together with them. On Fontanka Embankment there is one of the most beautiful mansions of the city belonging to the Russian Enlightenment poet Gabriel Romanovich Derzhavin. The farm that is mentioned in his verses "To the first neighbor" and "To the second neighbor" consists not only from the master's mansion with two wings: it is adjoined also by a wonderful greenhouse. Opening a massive pig-iron gate, passersby get to a light court of honor in the center of which near the monument to Derzhavin there is a small square with cozy benches standing in a shadow of the trees. In the wing enclosures it is also possible to find beds and benches which device reminds Italy. But these green zones are not the most remarkable vacation spots, because the landscape garden with a pond arranged at the end of the 18th century became one more integral component of the estate. Behind the massive house there is a channel with bridges, arbors and Summer Theater keeping far from pryung eyes. However, the landscape garden that was called Polish earlier appears at Petersburgers in a new shape today: it was reconstructed several times, and at the time of blockade practically all trees were cut down. In 2011 it opened after reconstruction and now looks more than accurately and impressively. However, today you have to pay 50 rubles for an entrance to a farmstead recreation area. The Botanical Garden of the Komarov Botanical Institute of the Russian Academy of Science on the street of professor Popov is well-known, and here is his "younger brother" laid out at the university most often is kept in the background. Of course, its construction began later (in the thirties the 19th century) and it occupies the more modestly territory, however dazzles with variety of flora including exotic. In the collection— there are over 4500 plants, among which there are coniferous, cactuses, succulents and other rarities. Since 1935 the Botanical garden of St. Petersburg State University is considered a cultural monument. By the way, it distinguished itself at the time of the Great Patriotic War when employees, despite bombings and hunger, continued carrying for the collection and saved it for posterity. It is possible to get here in Open Days. always silent and deserted therefore here it is possible to come and have a rest, think and try to tell fortunes without fail. One more wonderful place that can be found, walking on Fontanka Embankment. Once there was an estate of the associate Peter the Great, the general Andrey Artamonovich Rumyantsev. Now it ia an accurate, sweet smelling from green plantings park surrounds the building of Youth theater. In a shadow of trees there are extraordinary samples of the modern art, including the well-known St. Petersburg angel symbolizing intelligence and warm-heartedness of elderly citizens. By the way, Izmaylovsky "was spotted" at cinema, having got into the shot of the well-known screen version "The Master and Margarita" of Vladimir Bortko.